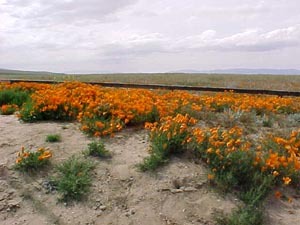 Yesterday (4/26/03) was Grandpa Bill West’s 87th birthday, on the drive back to OC, I told my mom that I really wanted to drive up to the CA Poppy Reserve and see the flowers. She called me at 10:30am today and asked if I wanted to go. Lunch: Where else? But El Camino Real, in Fullerton. Cheap, good, and the ice for the drinks is the lovely small, extruded ice bits. 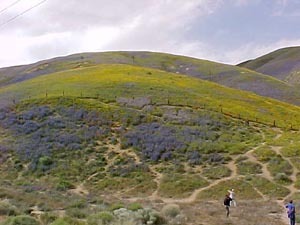 Real Purpose of Wildflower Hunt: Drive all over Southern California on a lovely day and get away from people. Route: 22 W to 5 North (stop in Fullerton for lunch) to 91 West to 605 N (avoid the 5 fwy between the OC county line and downtown LA like the plague) to 210 W to 5 N to 14 N to Ave I W (Lancaster Rd.) to Poppy Reserve to 138 W to Gorman Post Rd. to 5 N to Frazier Park W to Mt. Pinos back to 5 S to 210 E to 605 S to Dinner (Cerritos, Indian Food) to 91 E to 5 South to 22 E to Jen Home. The truth of the matter is that Mom and I have a history of “just taking a small little drive” on a Sunday. Once we started in San Diego and ended up in Mammoth, Mom Husband #2 was not so pleased with us. Today’s drive was delightful, temps in the 60s (F), big clouds in the sky, the tail end of April post-rain wildflowers, the dog happily alert in the backseat, etc. The best parts of the drive were all the poppies from west Lancaster to Gorman, the lupine & poppies on the hillsides of Gorman, and driving up to Mt. Pinos and seeing snow. When one lives in SoCal, snow is actually a fun sightseeing activity. While at dinner at the Ashoka the Great, Mom said, “Today is the sort of thing that you ought to write about in your new blog. 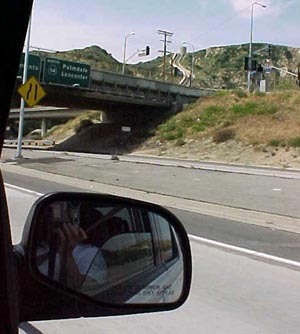 You know, going from City to Desert to Mountains back to City again.” Ever since I showed her Where is Raed, Mom really likes the idea of blogs, even though she doesn’t like to turn on her own computer…. by Ms. Jen on Mon April 28, 2003 | Permalink | fun stuff.